Habitat: It grows among rocks always under bushes. 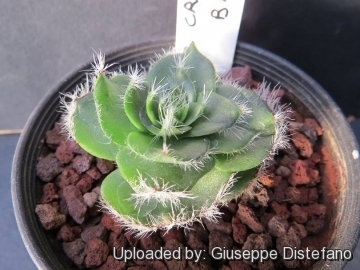 Description: Crassula barbata (Bearded Leaved Crassula) is a biennial or annual rosette-forming succulent species up to a span high when flowering, usually with one rosette with leaves spirally arranged and old ones remaining attached to stems. Leaves are glabrous but characteristically bearded along the truncate apex with long white spreading hairs. The spikes of small, white to pinkish flowers appear in spring. The rosette will open up as the centre extends to form the tall flower stem, and after flowering it will die. Fortunately the dying rosette usually produces a number of basal rosettes which can be detached and grown on to repeat the cycle. Rosette: Basal, 30-40 mm in diameter usually solitary, or proliferating from the base to form small groups. Leaves: Very thin, scarcely succulent, numerous, connate in opposite pairs, hemispherically imbricate and arranged in four overlapping ranks, (10-)25-35(50) mm long and (10-)15-35(-40) mm broad, soft, green to grey-green, erect or spreading, with a spathulate petiole, expanding into a shortly obovate or cuneate-flabelliform lamina, rounded to abruptly cut off at top, dorsiventrally flattened, glabrous and fringed with conspicuous rigid marginal hairs 4-8 mm long, membranous when dry. The surface of the leaves is able to absorb whatever moisture reaches them in the form of dew or mist and a leaf may absorb in a single night more water in this way than it loses by transpiration in a week.. The shape and size of the leaves of this species are often variable within the same population, but there is a tendency towards narrow leaves eastwards towards Prince Albert. 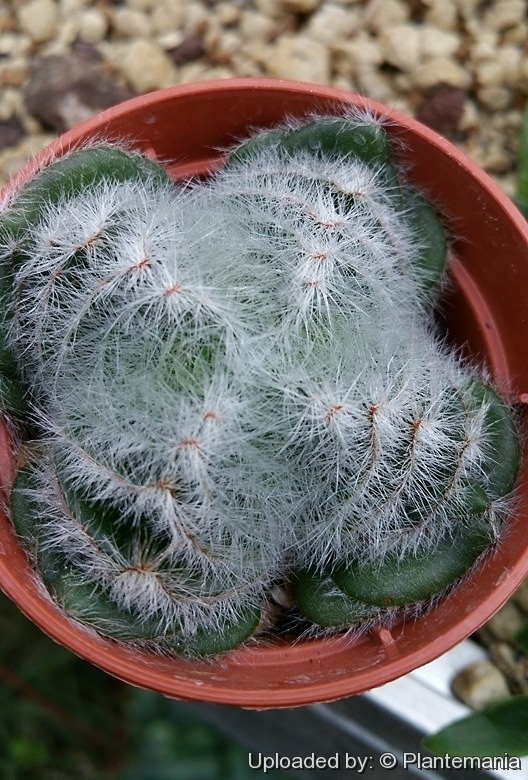 Throughout the range the species is, however, easily distinguished by the very long marginal cilia which are often clustered into groups, particularly in the Cedarberg. Inflorescence (spike-like thyrse): Flowers stem glabrous 15-30 cm tall, slightly angular, erect, simple but sometimes branched, more than half of it occupied by the spiked inflorescence, with opposite subdistant leaf-scales below, angular, floriferous above. Cymules capitato-fasciculate, 12-25 mm apart, sessile in the axils of opposite, scale-like bracts, forming a long spicate-thyrsus with sessile flowers with indistinct peduncle covered with leaflike bracts gradually decreasing upwards. Flowers: Sepals short, ovate to blong-triangular, 2,5-3 mm long, nerved, glabrous except for few marginal cilia, fleshy, green. Corolla tubular, fused basally for 1-1,5 mm, white to dark pink. Petals connate at base, oblong, sub-spathulate, suberect with recurved points 3,5-5,5 mm long . Stigma almost sessile and broad. Stamens 3-4.5 mm, anthers black. Chromosome number: 2n = 14 and have large chromosomes. 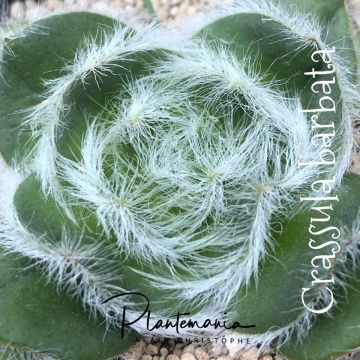 Crassula barbata Thunb. : (subsp. barbata) has solitary rosettes with very long marginal cilia often clustered into groups. Distribution: Prince Albert along the Karoo mountains to the eastern Cedarberg. 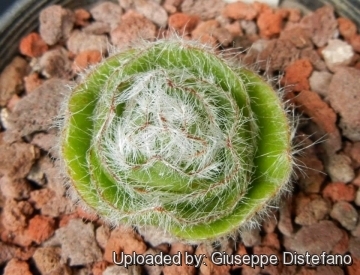 Crassula barbata subs. broomii (Schönland) Toelken: has leaves are 30-40 mm long, 20-35 mm broad, with much shorter cilia (less than 1 mm). Distribution: recorded only from near Victoria West. 11) Toelken, H.R. 1997. 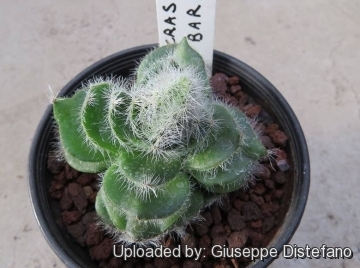 “A revision of the genus Crassula” in southern Africa. Annals of the Bolus Herbarium 8,1-595. 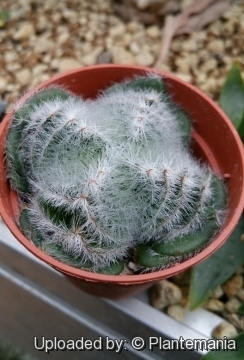 Cultivation and Propagation: Crassula barbata is a one of the most frustrating species to grow, but properly grown, in a compost that is not too rich, in a good light, and not overwatered, a single rosette will become a beautiful sight as the leaves curve inwards and the plant assumes the appearance of a hairy ball. They are often grown in small bonsai pots. Propagation: Seeds/ Offsets. Sow seeds in autumn. Place cuttings in clean river sand, mist every three to four days, roots should appear within 2-3 weeks.